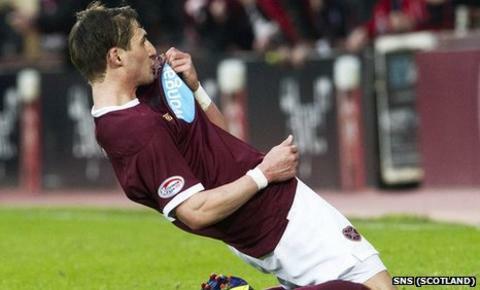 Hearts have agreed a deal with Rudi Skacel that keeps the 32-year-old Czech playmaker at Tynecastle until the end of the season. The midfielder's contract was due to expire on 31 January, but an extension has been successfully negotiated. Skacel is in his second spell with the Edinburgh club and is the leading scorer this season with nine goals. He wrote on Twitter: "I am happy to say we came to an agreement and I am staying. Let's go Jambos!" One player leaving Hearts was 25-year-old striker Evaldas Razulis, who joined the club from Kaunas last year, was loaned back to the Lithuanians and who has now rejoined the club in his homeland on a permanent contract. However, defender Craig Thomson is back at Tynecastle at the end of his loan deal with Kaunas. Meanwhile, midfielder Jamie Walker has returned to Raith Rovers on loan again until the end of the campaign.